If there’s a silver lining in crashing a supercar – trust is, it’s a very thin lining – it’s that maybe, in some way shape or form, the car can be salvaged and restored, good as new. 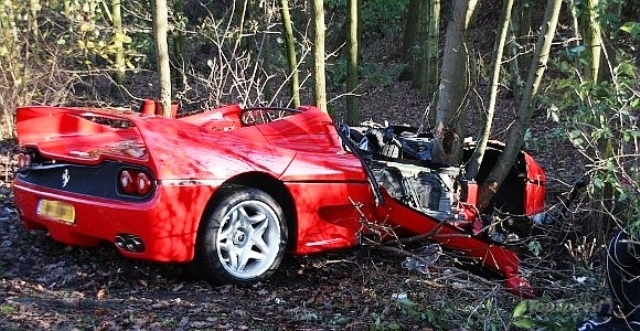 Unfortunately, this extremely exclusive Ferrari F50 is anything but salvageable after it crashed near Rotterdam in the Netherlands. The 56-year old driver was with a child, plowing through the A20 highway when he lost control of the F50, sending it careening into a tree right next to Zevenkamp exit. The driver escaped with some minor bruises but the child, regrettably, wasn’t as lucky, breaking both legs as a result of the car on tree collision. The unfortunate reality with crashes of this nature is that, more often than not, somebody gets seriously hurt and while the child has been sent to the hospital and is recuperating rather nicely, we still can’t help but think that this could have been all avoided if the driver was just a tad more careful.